Shop online for over 2,300 intermountain model trains. Locomotives is the most popular of the 6 intermountain model trains categories, then Freight Cars, and Passenger Cars. This is the N Scale 60' Wood-Deck Flatcar - Kit - Undecorated from Intermountain Railway Company. This is the N Scale EMD SD40-2 - Standard DC - Grand Trunk Western (blue, red, white) from Intermountain Railway Company. 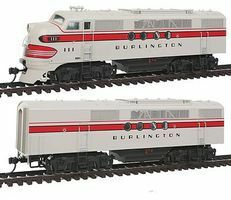 This is the HO Scale EMD FTA-B Set w/DCC - Chicago, Burlington & Quincy (gray, red) from Intermountain Railway Company. This is the HO Scale GE ES44AC - Standard DC - Union Pacific (Armour Yellow, gray, Flag Logo & Building America) from Intermountain Railway Company. This is the HO Scale All Brass Insulated Wheel Sets pkg(12) - 33'' by Intermountain Railway Company. This is the HO Scale EMD FTA-B Set w/DCC - EMD (Demonstrator Scheme, green, yellow) from Intermountain Railway Company.